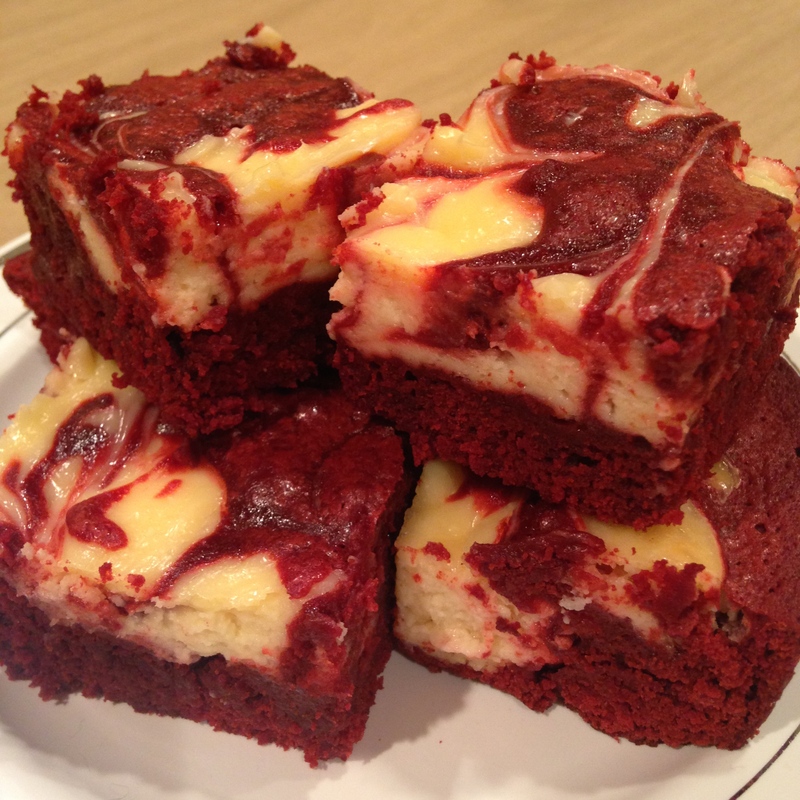 Just in time for Valentine’s Day, I bring you red velvet cheesecake swirl brownies from Sally’s Baking Addiction! Most people know that red velvet is delicious, but a lot of people don’t know what red velvet actually is. Red velvet is a mixture of chocolate and vanilla flavors – it includes both vanilla extract and cocoa powder, but the amount of cocoa powder is significantly less than you would use for chocolate cake/brownies. 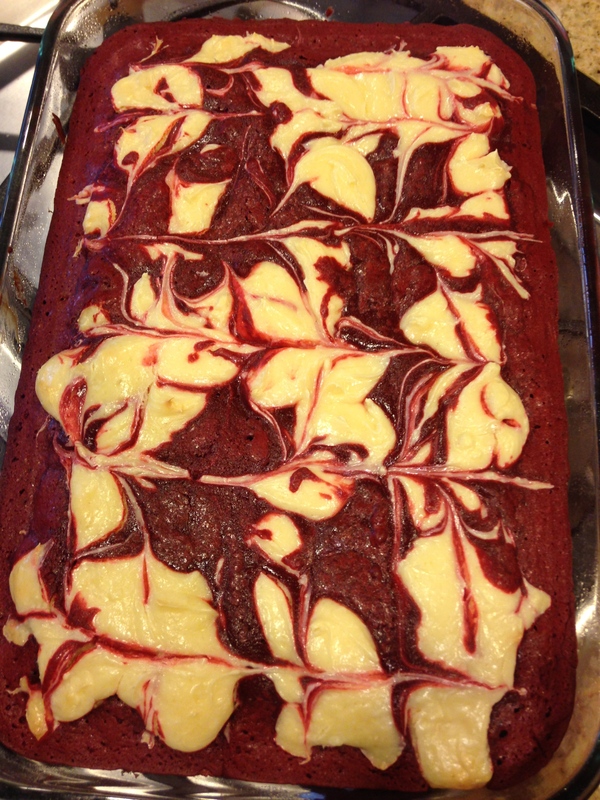 Traditionally, red velvet cake is topped with a cream cheese frosting. This recipe puts an awesome twist on that by incorporating the cream cheese in the form of a cheesecake swirl. These brownies are the perfect Valentine’s Day treat because they look so beautiful with the vibrant red and white(-ish yellow) swirls, and they’re also different from your average cookie or brownie. This was my second time making red velvet from scratch and I could not be more pleased with the results. The first time I made red velvet was for Nutella stuffed red velvet cookies, that actually came out tasting amazing but did not exactly look like red velvet (hence, they haven’t made it to the blog yet). This time around, I went all the way with the red food coloring and the brownies came out not only tasting fabulous but looking fabulous too. 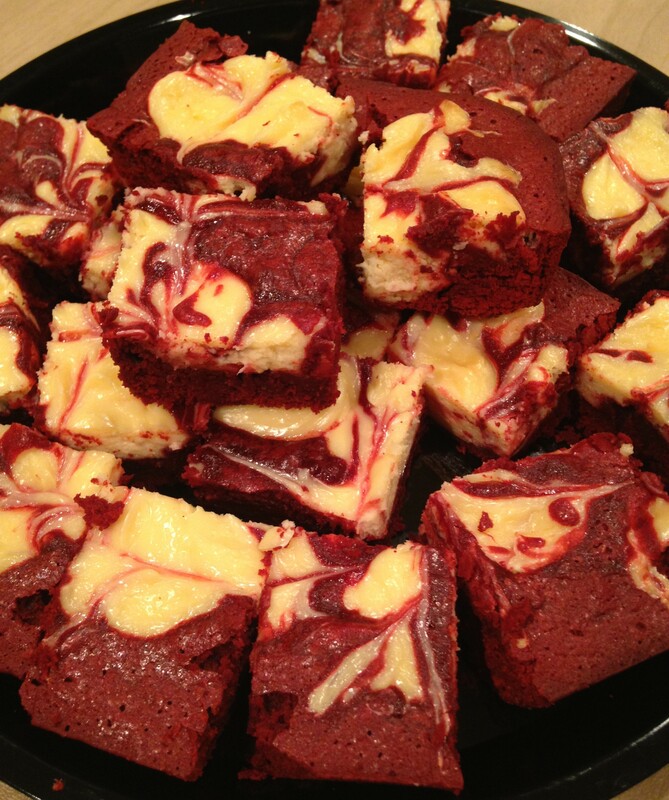 These brownies take a LOT of red food coloring. Since I made a double batch, I actually needed almost an entire bottle of McCormick’s red food coloring (the 1oz bottle they sell at my local grocery store). When I made the Nutella stuffed red velvet cookies, I shied away from using the entire amount of red food coloring that was called for because 1) it just seemed like SO much, 2) I didn’t have that much red food coloring in the house, and 3) the cookie dough was so brown that it seemed unlikely to me that any amount of food coloring could actually turn it red. 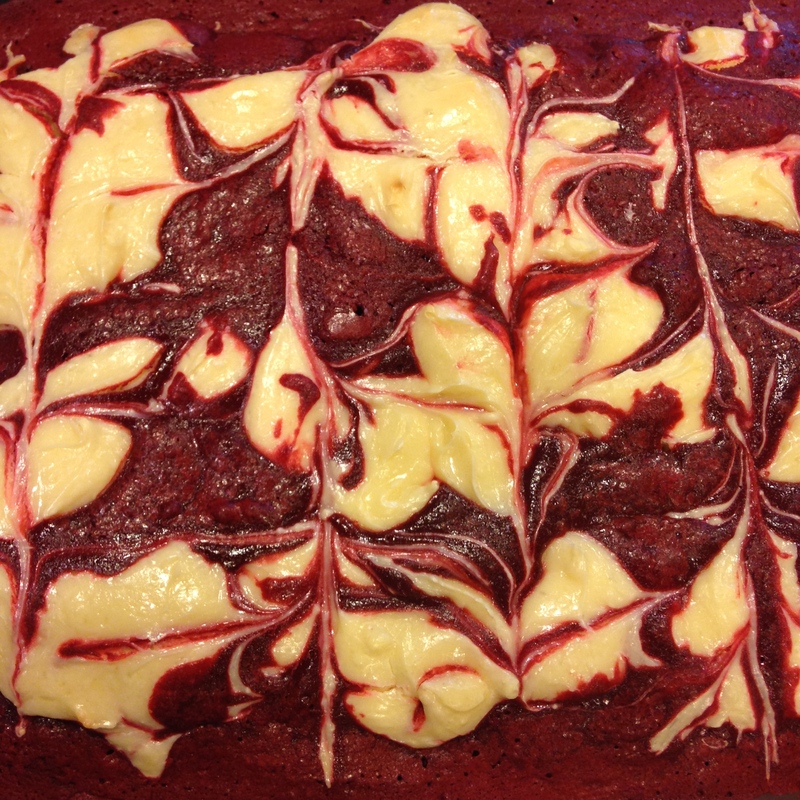 This time, I stuck to the recipe and lo and behold, it resulted in beautiful red brownies. And here’s a fun fact for you – these brownies have white vinegar in the recipe because the acidity of the vinegar causes a reaction that actually brings out a stronger red color. Don’t worry, you won’t taste it! 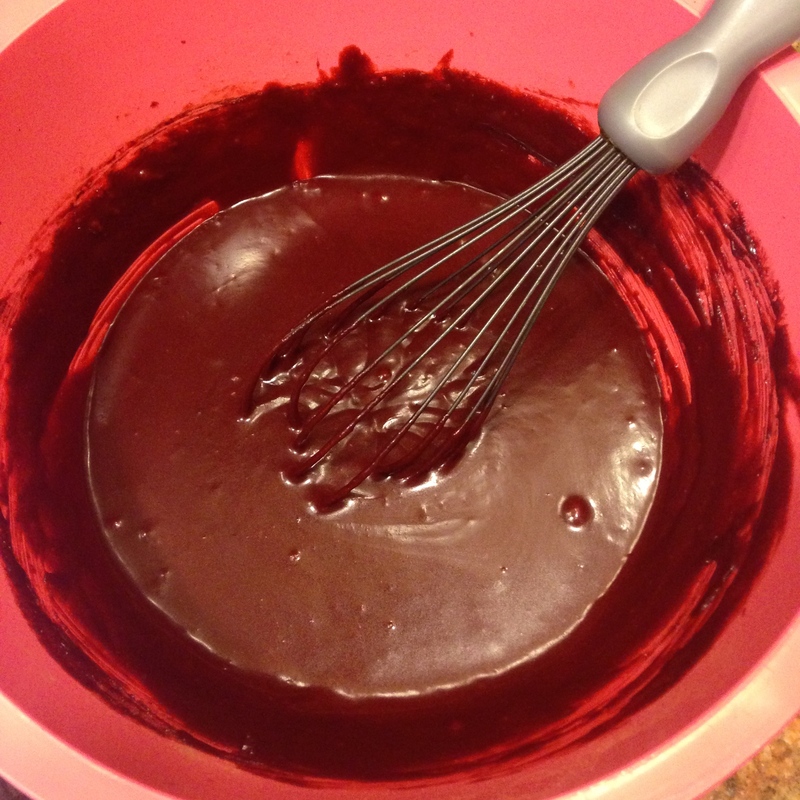 Begin by making the brownie batter: In a small bowl, beat 2 eggs together and set aside. In a large bowl, one at a time combine melted butter, sugar, vanilla extract, cocoa powder, salt, food coloring, and vinegar. After adding each new ingredient, stir until combined. Then whisk in the eggs. Next, use a spatula to fold in the flour until completely incorporated (photo is mid-folding). Once fully incorporated, pour the brownie batter into a greased baking dish, leaving about 3-4 tablespoons of batter to use later. 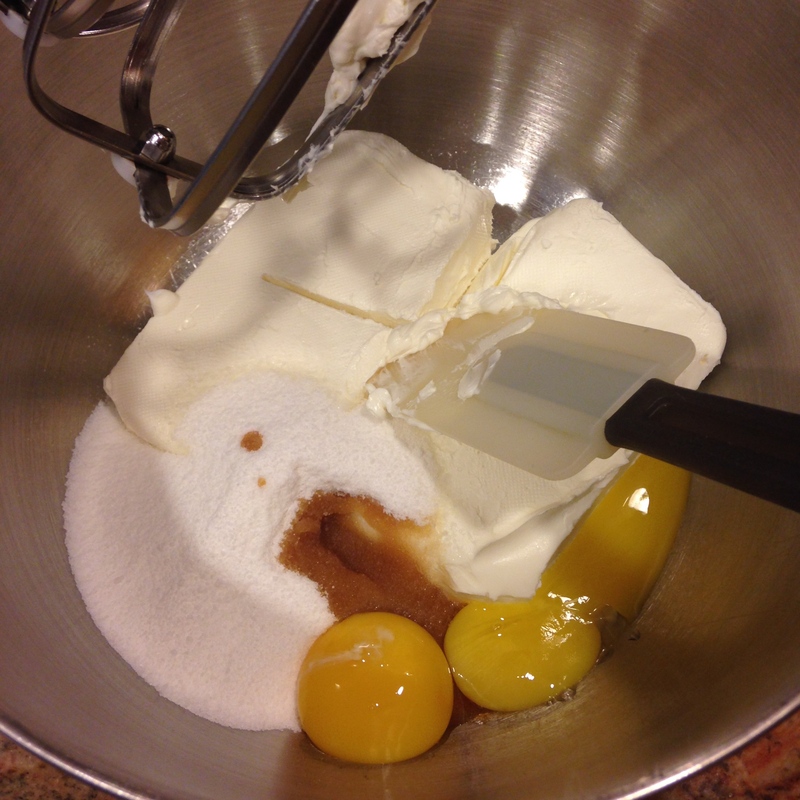 Make the cheesecake part: With a hand-held mixer on medium or a stand mixer on low-medium, beat together softened cream cheese, sugar, egg yolk, and vanilla extract (there are two egg yolks in the photo because I doubled the recipe). Mix until completely smooth. Swirl the brownies: To be honest, I wasn’t 100% sure what I was doing when I did the swirling part. I found the instructions on Sally’s Baking Addiction to be slightly unclear, and she didn’t have photos of the whole swirling process. 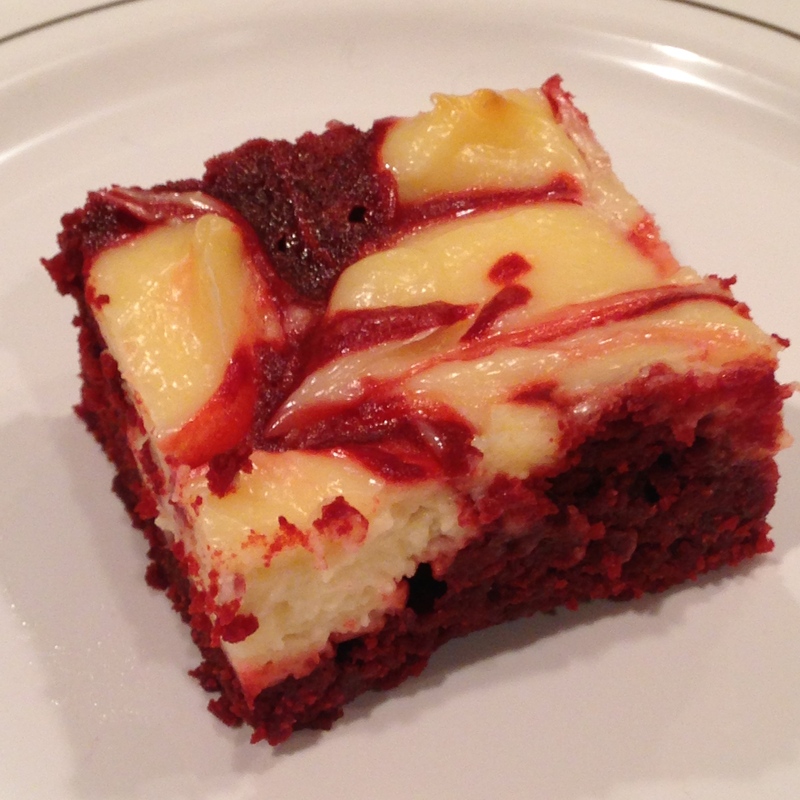 Fortunately I found out that you can’t really go wrong when you’re swirling red velvet brownies and cheesecake, so even if you’re hesitant, it will probably still come out great. 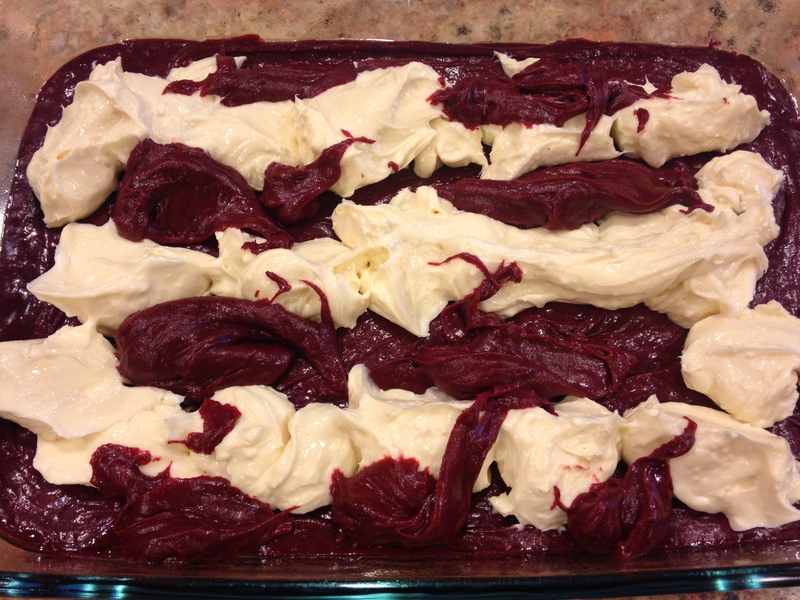 I started by dropping big blobs of cheesecake batter on top of the brownie batter in three thick goopy lines. Then I used the extra brownie batter that had been set aside to fill in between the cheesecake batter lines as much as I could. Then I used a butter knife to make the swirls by dragging the knife through the batter in different directions, both horizontally and vertically. You can start by dragging it through alternating up and down, and then from right to left and left to right. Drag it through as many times and in as many directions as you’d like, until you’re happy with the pattern you created. You can also try the approach described here, in a similar recipe. The only thing I would change about mine is I think I would try and get the cheesecake spread out more, because when I cut the brownies there were some pieces with very little cheesecake and some with a lot. Finally, bake on 350 for 28-30 minutes, or until a toothpick inserted in the center comes out clean. If you make a double batch you can bake on 350 for 40-45 minutes. Preheat the oven to 350 degrees and grease an 8×8″ baking dish with nonstick spray. 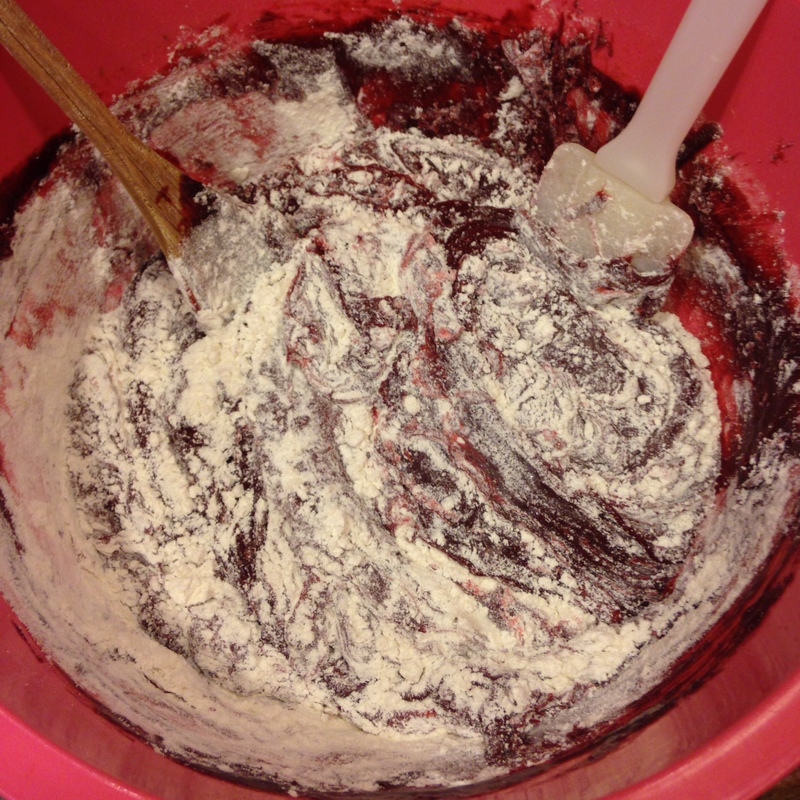 Make the brownie batter: In a small bowl, beat together 2 eggs and set aside. In a large bowl, combine the following ingredients one at a time, stirring after each addition: melted butter, 1 cup sugar, 2 teaspoons vanilla extract, cocoa powder, salt, food coloring, vinegar. Whisk in the eggs. Using a spatula, fold in the flour until completely incorporated but do not over-mix. Pour the brownie batter into the prepared baking dish, leaving about 3-4 tablespoons of batter in the bowl. Make the cheesecake swirl: With a hand-held mixer on medium or a stand mixer on low-medium, beat the softened cream cheese, 1/4 cup sugar, egg yolk, and 1/2 teaspoon vanilla extract until completely smooth. 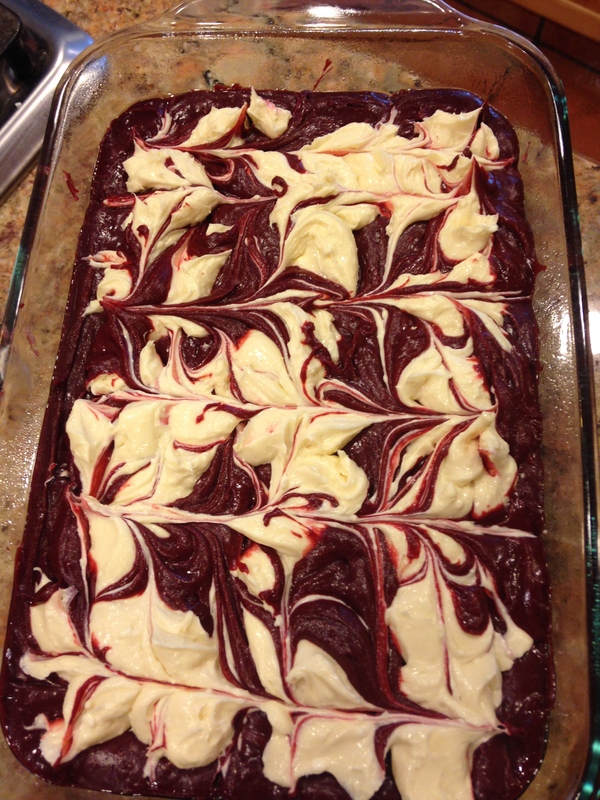 Make the swirls: Drop big spoonfuls of cheesecake mixture on top of the prepared brownie batter, creating three horizontal lines. Then fill in some of the surrounding area with the additional brownie batter. Drag a butter knife through the entire thing, in both horizontal and vertical lines. Start by going up and down and then go perpendicular from right to left and left to right. Continue dragging the knife through until you’re happy with the swirled pattern. Bake the brownies for 28-30 minutes or until a toothpick inserted in the center comes out clean. Allow the brownies to cool completely before cutting.